This is my mom's original chili recipe. 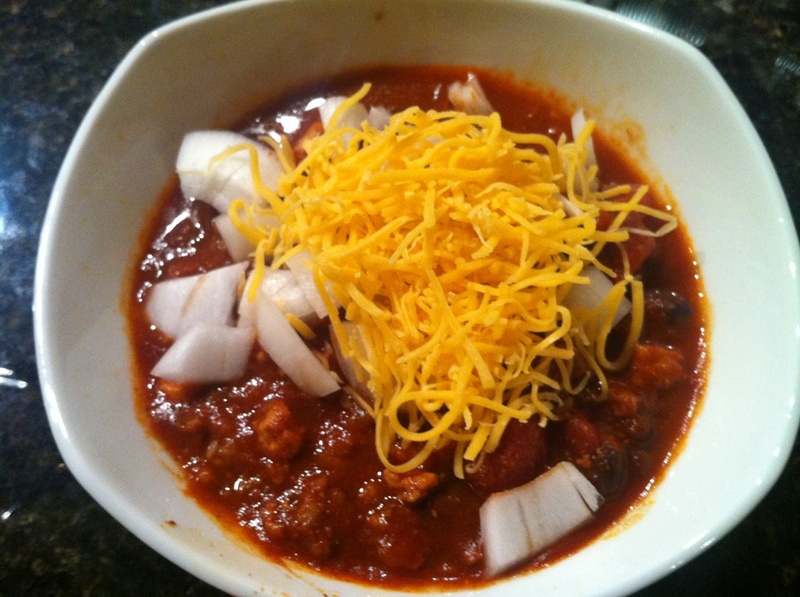 If you want to win a chili cook-off, make this recipe! It is guaranteed to impress. Brown the meat (ground beef, ground turkey and sausage), one at a time in the microwave in a pyrex measuring cup, covered with a paper towel. Crumble the cooked meat every few minutes with a fork. It should take about 5-7 minutes per pound of ground meat in the microwave. Drain fat into a can (do not put down disposal). ***Remember to add a few dashes of garlic salt to the ground turkey and ground beef before cooking it in the microwave. In a large pot, saute onion, jalapeno and 1 1/2 tsp. olive oil until soft. Combine the rest of the ingredients (ground beef, ground turkey, sausage, diced tomatoes, chili seasoning, tomato sauce, black beans, green chiles, brown sugar, garlic salt) in the same pot that you sauteed the onion and jalapeno in. Here is your finished product. Yum!!!! Serve chili with fritoes (small size), finely shredded mild cheddar cheese, chopped white onion and corn bread. You can also serve this with tamales, hot dogs & buns for chili dogs, or saltine crackers. It is best to make this a day ahead of time to meld the flavors! If you want more of a “kick” and you want it to have more liquid, add 1 - 6oz can of Spicy Hot V-8 juice. You can always freeze the leftovers!